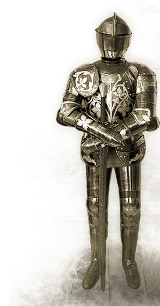 HistoricalMarket.com - Touch The History! We are proud to inform you, that since 28th of December 2013 we have changed the legal form of the business. All data are shown in 'About us' section. We are still working to provide as good service to our customers as we can: all placed orders will be proceed, quarantee is still valid. If you have any problems to login to your account please check your e-mail. You have to agree to transfer your personal data from Arma s.c. to CCS Silesia Ltd. If you have not received an e-mail from us please contact us. No time for shopping? You're not sure what to choose... Are you already late? This is a solution for you! 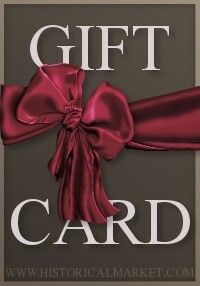 You may buy this Gift Card, print it at home, fold and pack nicely. Here you go! Now you can give it as a gift. And you can be sure that it will be spent on goods that are most desired. 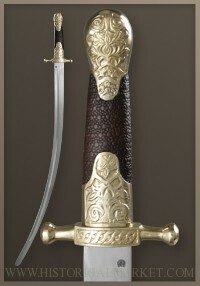 Design basis is sabre of 11th century of Karol Wielki. 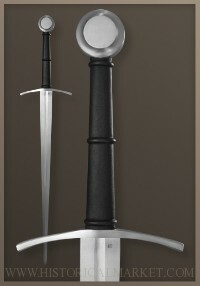 Characteristic, downward bented cross and quite heavy pommel makes this product very well balanced. 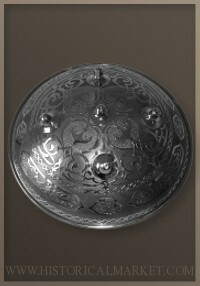 Steel-made shield, decorated with beautiful hand-made ornament paintings. Fabric interior, leather handles inside, that can be used to hang a shield on the wall. Hand and a half sword made accordingly to type XVIa of E. Oakeshott's typology. 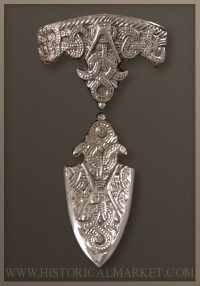 Copy of dagger dated from the turn of the fourteenth and fifteenth centuries. Parts has been cast in brass and then polished or patined. 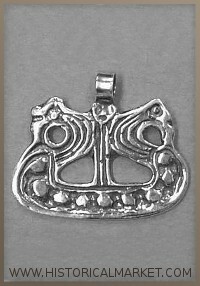 Scabbard fittings (mouth & shoe) with ornamentation based upon fitting (mouth) of a sword from Dybäck, Scania, south of Sweden. It is characteristic for a XI c. England, maybe it was produced there. 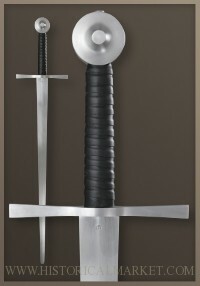 Medieval knight's sword from the time of the Battle of Grunwald. The model was developed based on the swords in the type XVII of Oakeshott's typology..
Sabre similar to an origin found in Goczew (Russia). 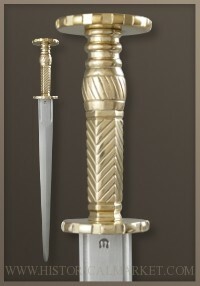 Characteristic, downward bented cross and quite heavy pommel makes this product very well balanced. That is why it is fast and handy. Please feel free to give us all comments regarding our website. Your opinion is the most important!